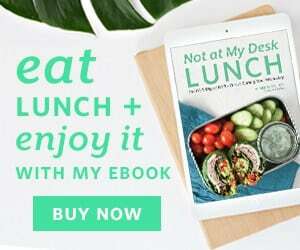 This is another installation in the #notatmydesklunch series, in which I share some small, actionable tips on how to get away from your desk at lunch, enjoy a great meal, and set yourself up to properly digest and get the nutrients your body needs. Please share your #notatmydesklunch meals on Instagram and tag me @small_eats. Last week I talked about the importance of eating lunch in a relaxed state, so our bodies can digest and get the nutrients we’re eating. The first step of eating and enjoying a #notmydesklunch and really getting the nutrients your body needs was getting away from your desk, from being distracted and stressed out. This week, it’s all about being present. Before you chow down, take a deep breath, in through the nose and out through the mouth. Center yourself and get in the present moment. This small action does a few things for you. 1. It can calm you down. When you’re stressed or anxious (which is very common while you’re working), you don’t breathe as deeply, limiting your oxygen intake. This also doesn’t help you calm down, or feel any level of relaxation. 2. It can slow you down. If you’re in a stressful work environment, it’s really easy to feel like your trapped in a rollercoaster. Taking a deep breath and getting away from your desk with a healthy meal will be a break from the madness, which will help you get through the day. 3. You’ll be able to digest your food properly. Now that things are slower and a little less chaotic, the rest and digest mode can kick in and you can absorb your foods’ nutrients. 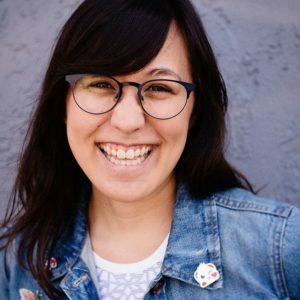 For some of us, just being away from our desks isn’t enough to truly disconnect from the circus happening there. A deep breath is one more way to firmly press pause on that for a little bit. Now that you’re more centered, let’s talk about the food. This lunch is a little more interactive, it’s harder to check out. 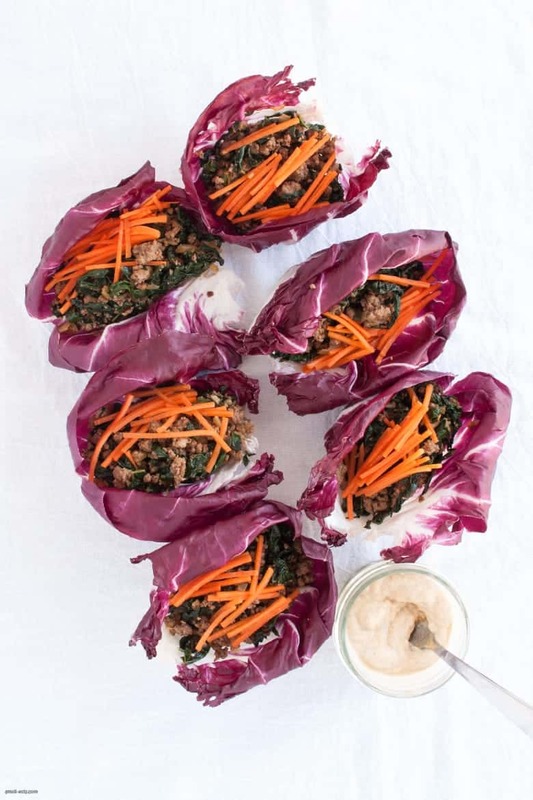 These Beef Radicchio Cups with Tahini Dressing require two hands, and sometimes a napkin if you get generous with your filling. The cups are easy to make and a joy to eat. These don’t have to stay just as a lunch either, they would make great appetizers or a dinner, too. If you’re a vegetarian and you want to get on the action, swap the ground beef out for lentils or some nut meat I’ve posted before. These cups are great warm or cold, too. If you prefer them cold and you’re packing a lunch, assemble them without the dressing. I put the dressing in a small mason jar and spoon it on when I’m enjoying it. If you want them warm, pack a container with the meat separately and warm that up before eating. When I warmed up the completely assembled cups, the leaves browned and weren’t as crisp. Feel free to swap out greens and raw vegetables. Topping this with fresh cucumber or sauerkraut would taste great, and any green works with the meat. I would love to see your #notatmydesklunch and where you’re eating. I’ve been posting my lunches on Instagram and giving tidbits of extra knowledge there. Hashtag your lunches and tag or mention me @small_eats. Bring a sauté pan to medium heat and add in ground beef. Break up meat with a wooden spoon and let cook until browned. Make a clearing in the center of the pan and add in the onions and garlic. Cook until translucent, about 3-7 minutes. Add in kale and cook until wilted, 5-10 minutes. Add spices and taste, adjusting seasonings as needed. Remove from heat when done. In a bowl, combine tahini, lemon juice, and spices. Add water as needed to get a looser dressing. 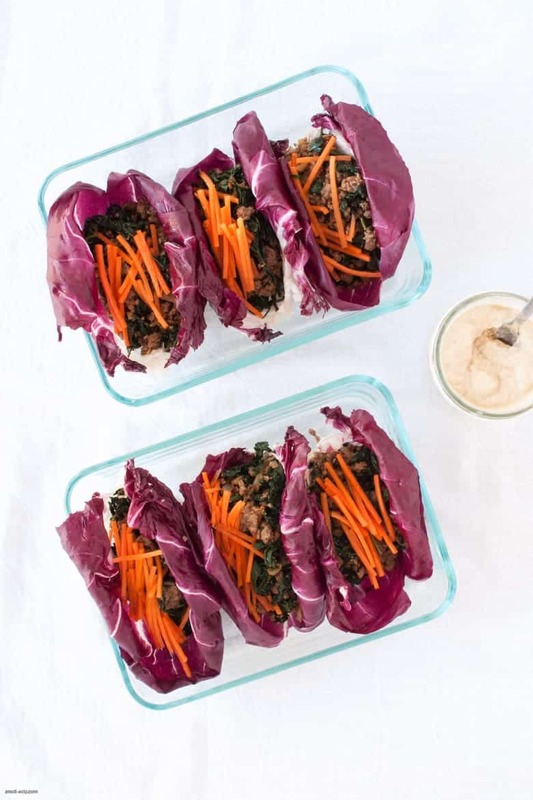 Over time tahini can seize up, so you may want to add a little bit of water to any leftover dressing. Taste and adjust seasonings. 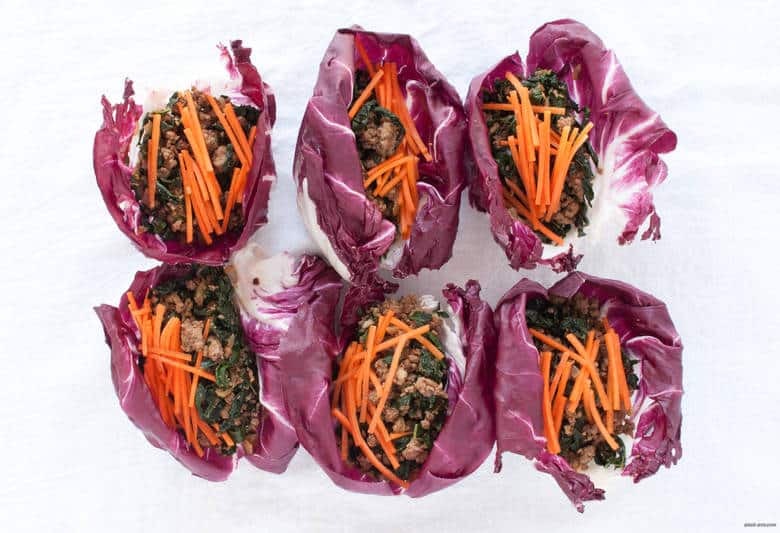 To serve, spoon the ground beef mixture into the radicchio leaf, then top with julienned carrot and dressing.